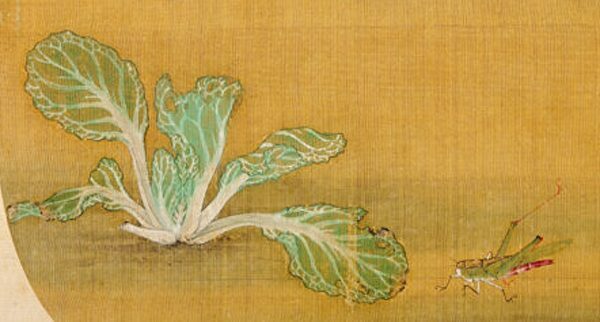 Wild Cabbage and Insects is a rare Chinese painting, with the simple cabbage as a subject matter. The painting is said to be the work of Xu Di, a painter from the Song Dynasty. 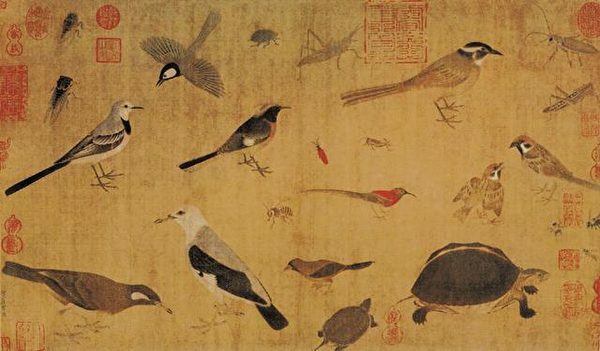 In the Song Dynasty, painters focused great attention on sketching and mastered skills and techniques to a high degree of perfection. The purpose of sketching is to enhance the understanding of the objects through the observation and depiction of the static and dynamic images and then, to master the essence and changes of the expressions and posture. In Wild Cabbage and Insects, Xu Di painted a small cabbage, a butterfly, a grasshopper, and a dragonfly, occupying the four corners of the picture, without any background material. This type of arrangement was extremely rare at the time. The lonely cabbage on the ground has some damaged leaves. Even though the eight leaves show signs of slight withering, they try to spread to four different directions and reach up into the air. A red-tailed grasshopper jumps over and could be attracted to the cabbage to have a good meal. Above the top of the cabbage, there are two low-flying visitors, the light-colored butterfly, and the black-winged dragonfly. Their goals are not obvious. They may also come to the cabbage for something, perhaps they just happen to be there, or find the cabbage irresistible, so they appear simultaneously. The four protagonists in the painting have nothing to do with each other. They only reflect the natural ecology in a simple way, but they do not know that they have unintentionally created the suspense of the next moment. In this very short space of time, a subtle tension is formed, which adds inspiration and interest to this inconspicuous picture.